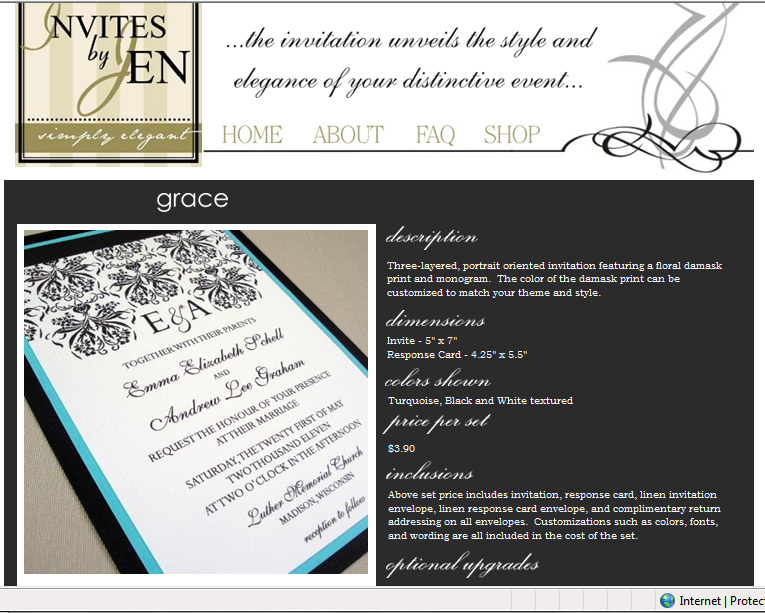 One of my goals for 2011 is to finish the revamp on the Invites by Jen website. 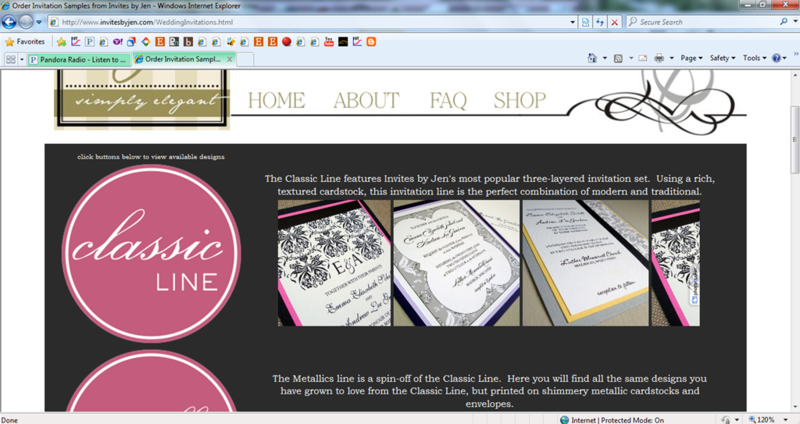 Had I just gone ahead and completed the new website design with only the elements from the old website, I would be done. However, as you can see from my list of goals for the year, I plan on adding many new products and designs. So, I decided to create my website with these new products in mind. Even though this means my website will be “under construction” for a while, you will at least continue to see previews and glimpses of wonderful things to come! On this page you can read the description of all the lines that will *eventually* be offered. The plan is to have a scrolling sideshow for each line (such as was done with the Classic Line). Also added today is the ability to request a sample of some of the designs shown on the website! Other exciting news is that this week I started working with Marie of MCM Portraits out of Allenton, Wisconsin. 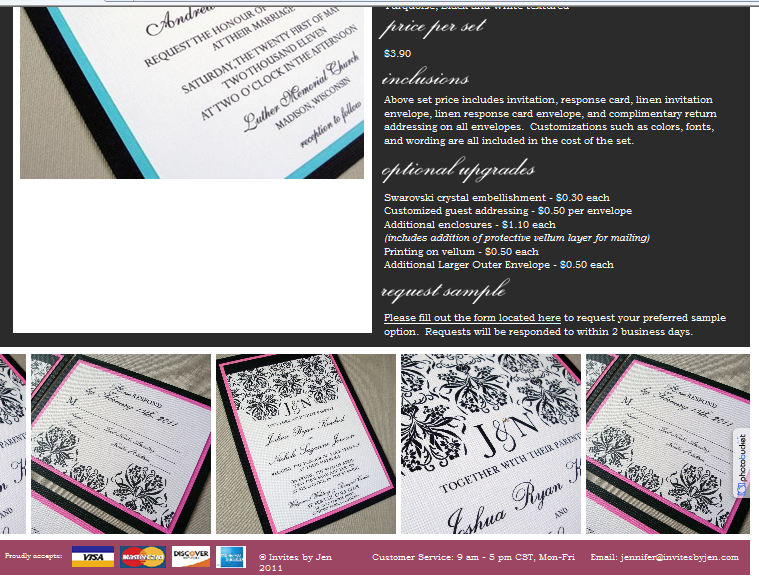 She will be photographing my invites so that I can provide you with a beautiful look at your future invitation set. Posted in 2011 Goals, Goals and Resolutions, New Products and tagged invite samples, website, wedding. Bookmark the permalink. You just got engaged and have shared the wonderful news with your friends and family. Now, you can start the planning process! One of the first things to do is ask those nearest to your heart to stand by your side on the big day. Why not ask them with a cute notecard? 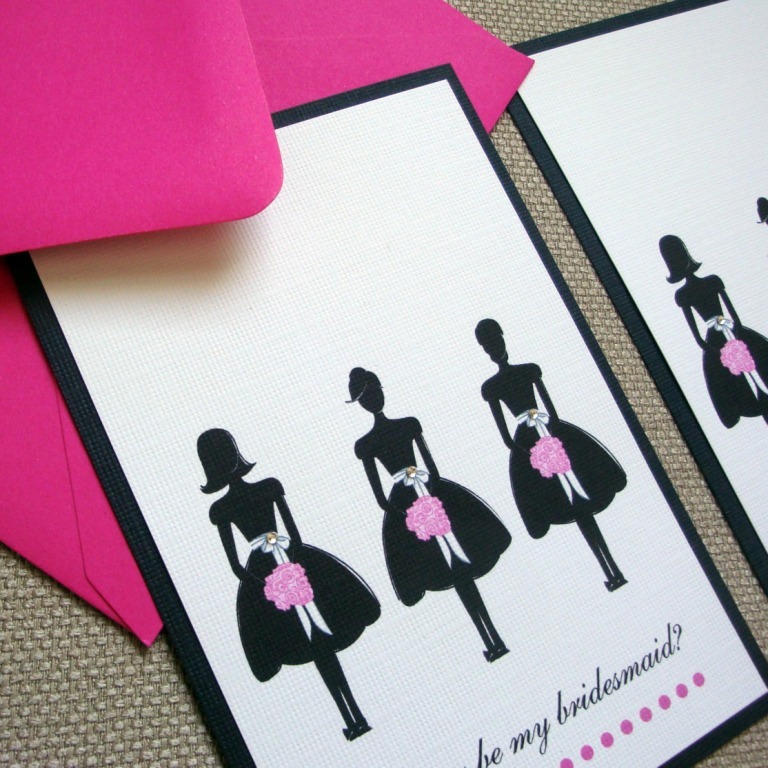 Invites by Jen now has wedding party cards available! Need a custom color or text option? Not a problem, just send me a quick note with what you are looking for. 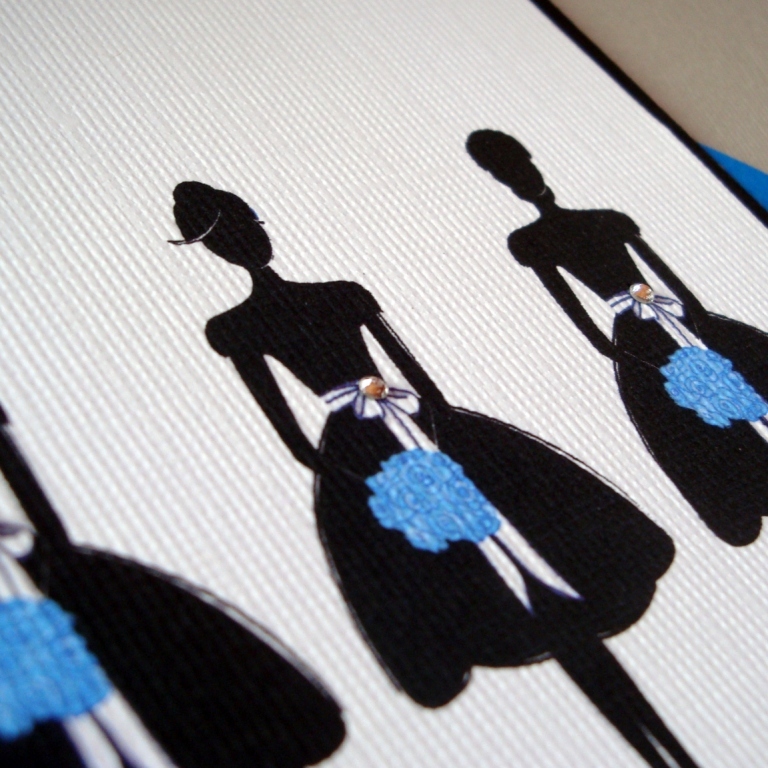 The current design features a trio of bridesmaids holding a colorful bouquet of flowers. The ribbon sashes on their dresses are adorned with a sparkling Swarovski crystal. The cards are currently available in my Etsy shop — check them out! FlourPot offers freshly baked cookies packaged in the cutest little box as a fun, original way to ask your friends to be in your wedding party. There are even different dress types available — the one pictured is her “Jessica” dress. Each gift is $12.00 over at FlourPot’s Etsy shop. How about a “Bridesmaid Proposal Ring”? 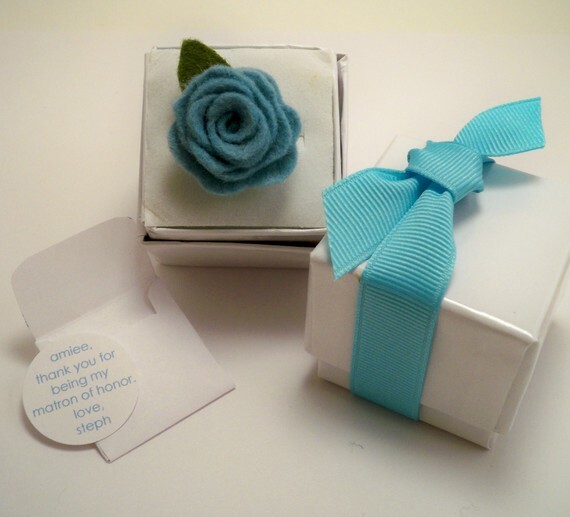 A handmade rosette flower is attached to a ring and comes in a pretty ring box. ButtercupMarketplace on Etsy offers these as a custom order for $9.00 a piece (free shipping is offered as an added bonus). 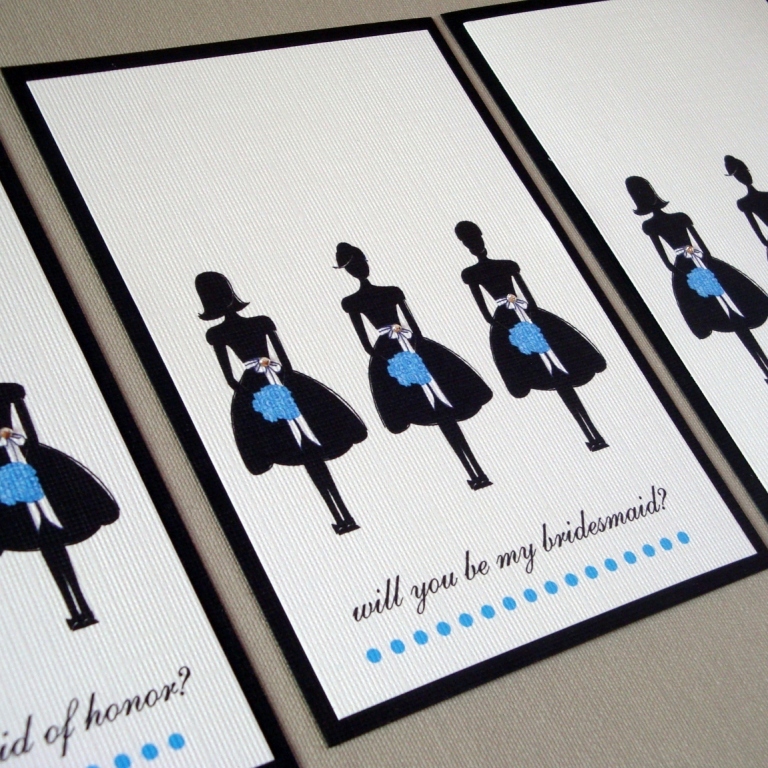 Posted in Etsy Inspiration, New Products and tagged blue wedding, bridesmaid cards, pink wedding, swarovski crystal, wedding party cards, will you be my bridesmaid cards. Bookmark the permalink. I love when I can take the time to do the “creative” part of my work such as scouring the internet and other resources for new fonts to add to my designs. I could spend all day looking at fonts and graphics and color schemes! I am happy to announce that I have added the “Carpenter” font to my design options. Any client can choose this font as a way to customize their stationery. What a special bonus! Any DIYer would have to purchase this font themselves, thus making the once-in-a-lifetime stationery not as budget friendly as one may have imagined! I have decided that my favorite “block” font to pair with this “script” font is DaunPenh, but in a customized way — in the following example the couple’s names are featured in Carpenter, but the block text in DaunPenh has a slightly different twist (added by your favorite invitation designer). The first letter of each word is slightly larger/higher than the rest of the word. I also like how the all-caps option make the text look so much more sophisticated. I love this new font and am very excited to design a custom suite based on the look and feel of the script text. 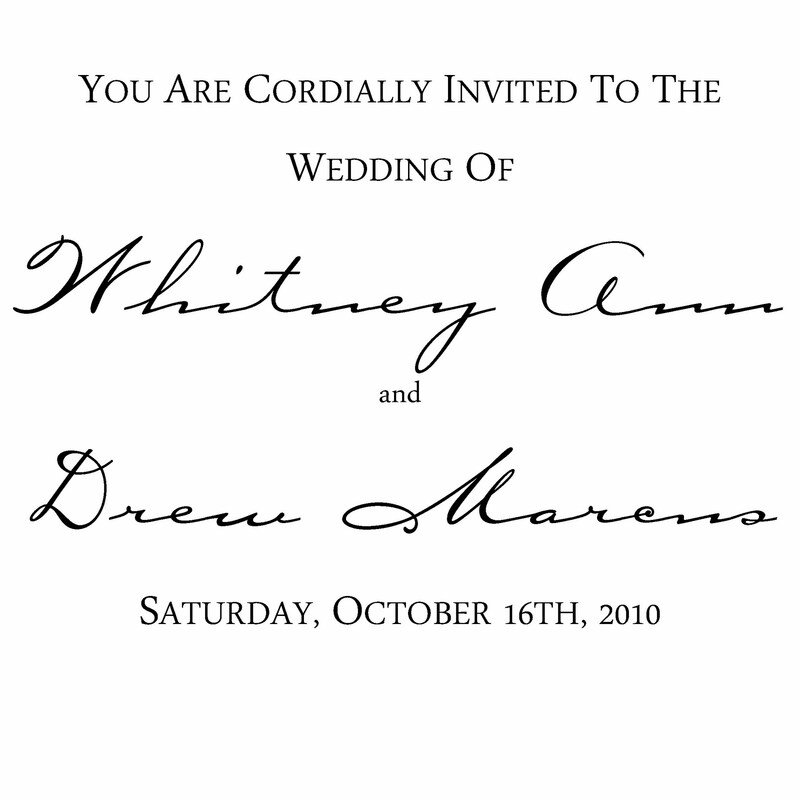 If you would like to customize your wedding invitations with this font, please visit my website to learn more about the ordering process. Pink is a timeless color choice when it comes to planning your wedding. In all shades, from light pink to dark fuschia, the color can be paired beautifuly with many different options to create an elegant, classic look for your wedding. 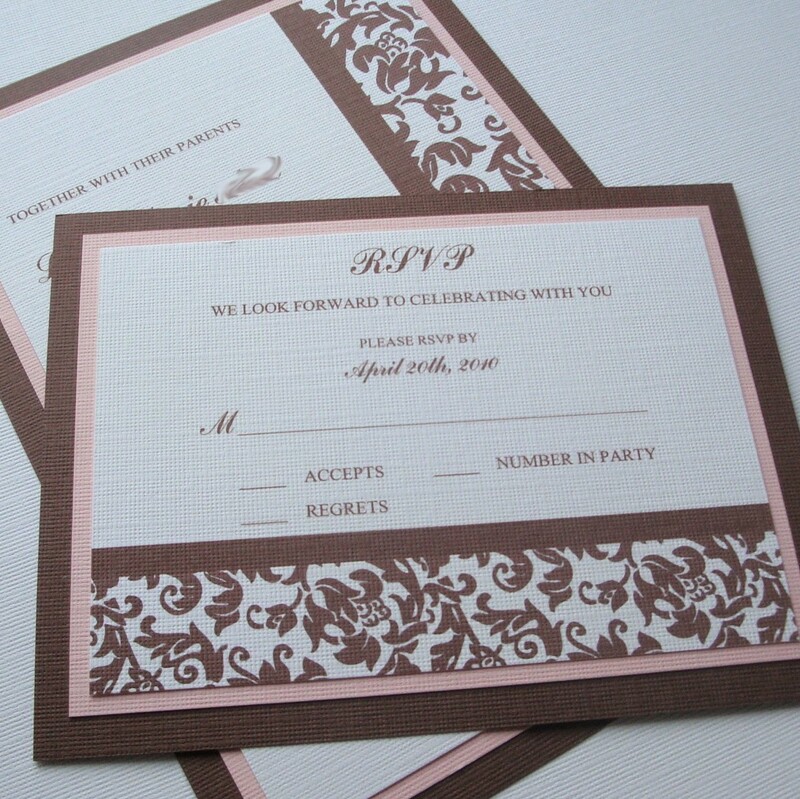 Just recently I created an invitation set for a couple using my light pink, pecan, and white color options. The invitation was based on my Jennifer invitation style. I updated the graphic color to match the pecan color. Along the same color scheme, I decided to add a few items to my Ready to Ship line in my Etsy store. What is my Ready to Ship line? These are items that are already made and “ready to ship”. Since there is no customization process involved, the items are also at a discount when compared to the same items in a customized order! All my Ready to Ship line items have at least a 20% discount! 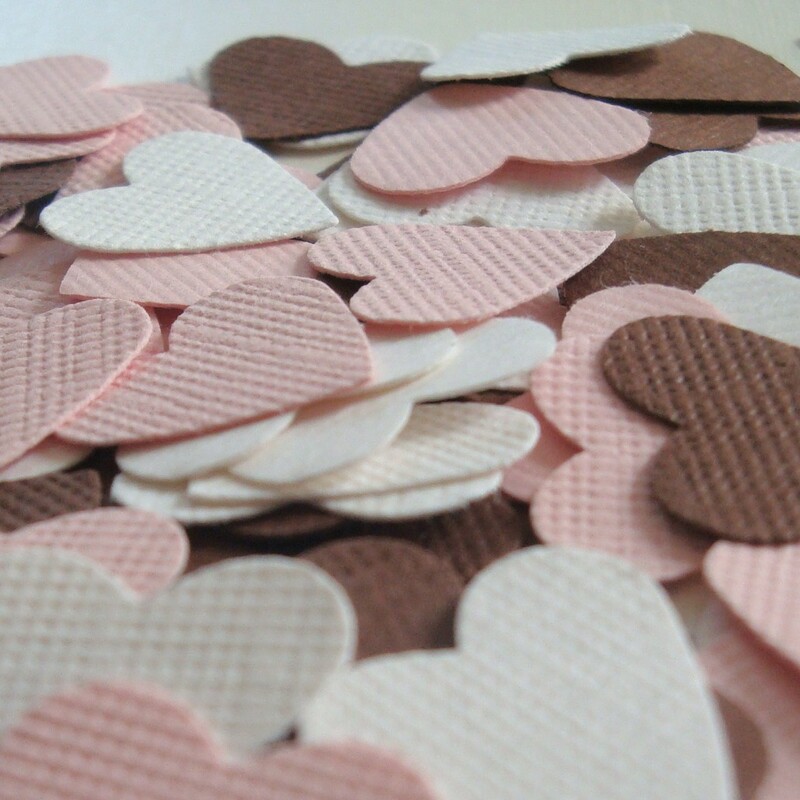 To add a little pizzaz to your tables at the reception, or even to decorate the aisle, I now have small heart confetti available. 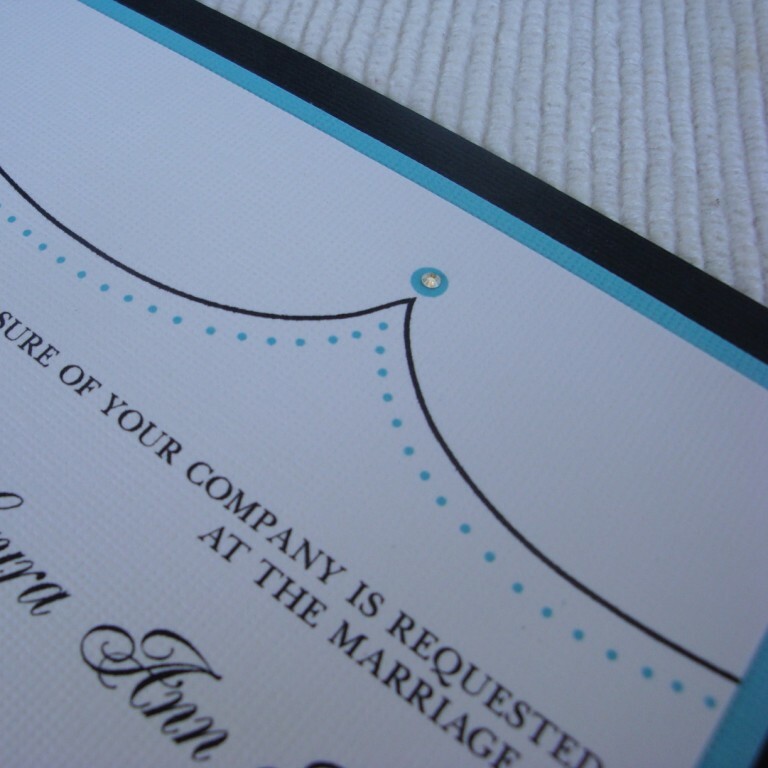 I offer both a simple confetti package along with confetti adorned by Swarovski crystals. What an easy way to add that special sparkle to your decor! 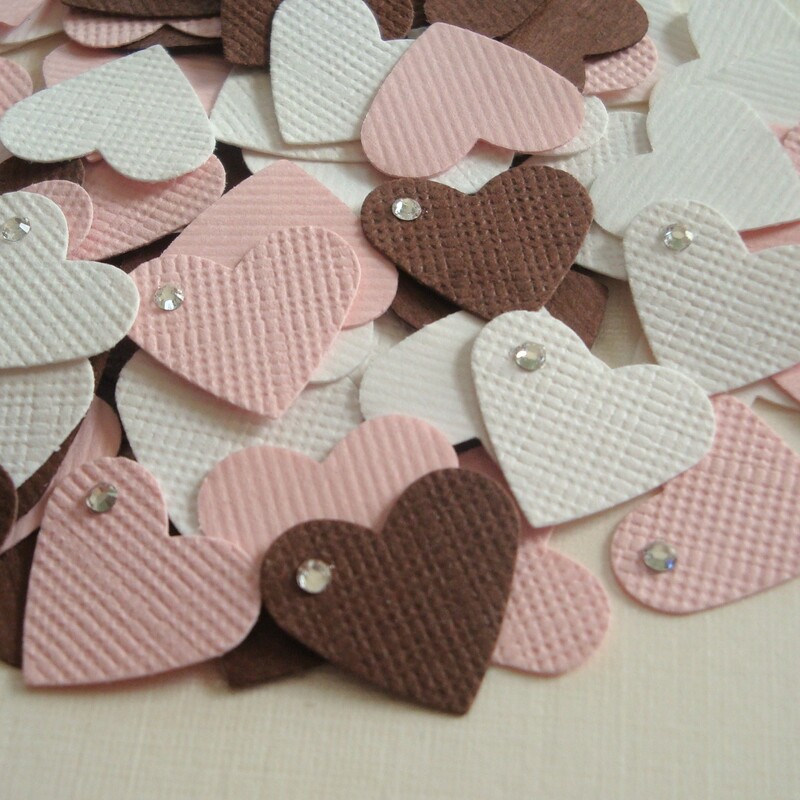 In keeping with this posts’s theme, the confetti pictured here includes light pink, pecan, and white hearts. 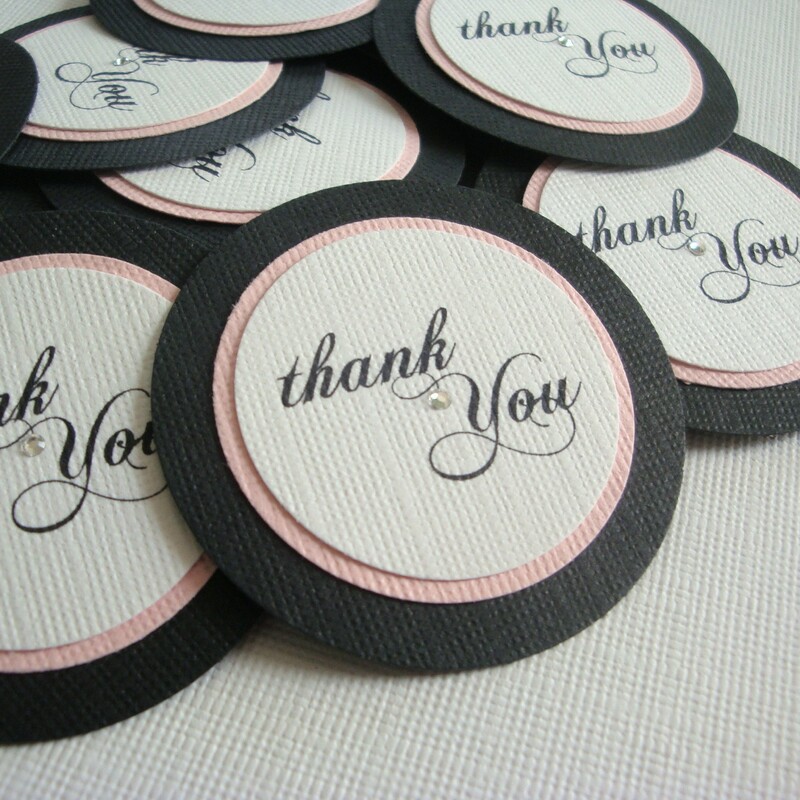 Favor tags are a great way to easily say “Thank You” to your guests and wedding party. Punch a hole in these and add them to gift bags, or simply adhere them to envelopes and favor boxes. Really, the sky is the limit — you can add a simple “Thank You” virtually anywhere! These particular tags include light pink, black, and white and are adorned with a Swarovski crystal. You worked tirelessly trying to coordinate and arrange the perfect seating arrangment for your reception. 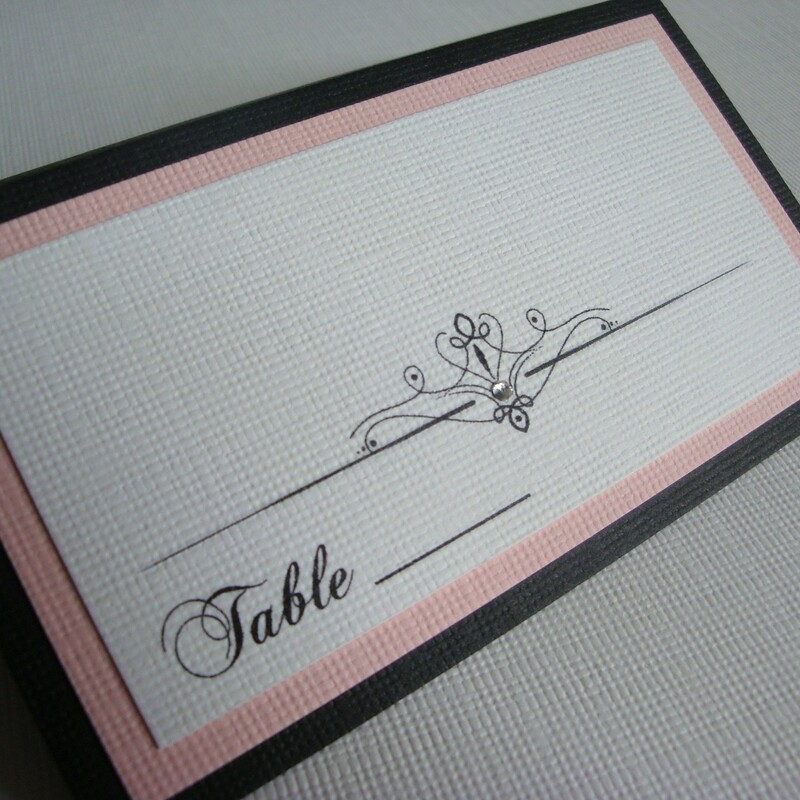 Use my Sophia style place cards to finalize all the seating details. This set is shown in light pink, black, and white. The cards are adorned by a Swarovski crystal and include an area to indicate a table number for your guests. Here is a set of table numbers in my Sophia style that incorporate the same light pink you see above paired with black and white. The table numbers are embellished by a matching shiny, white ribbon and are adorned with a Swarovski crystal! Posted in Customized Orders, New Products, Wedding Trends. Bookmark the permalink. For this client, we ended up doing a completely customized design — I loved it so much that I decided to add it to my lineup permanently! 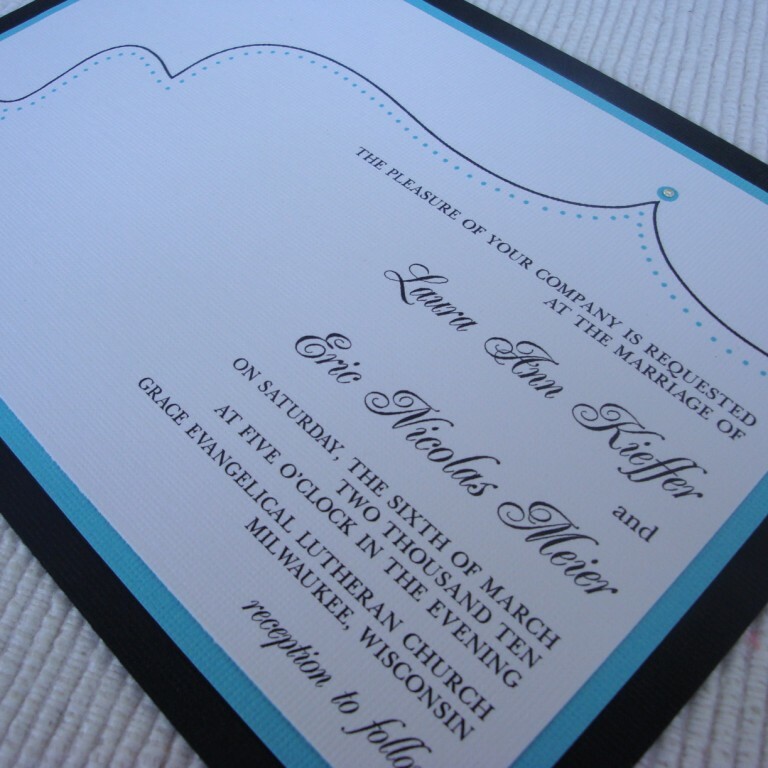 Because of this client, we can now all enjoy the Laura invitation set. To read even more referrals and hear what others have to say about Invites by Jen, please visit the referrals page on my website! Posted in New Products, Referrals. Bookmark the permalink. After doing the research and finding items for my previous Jackie O post, I decided to design something fitting for the category. Here is my new menu design — the Jackie! 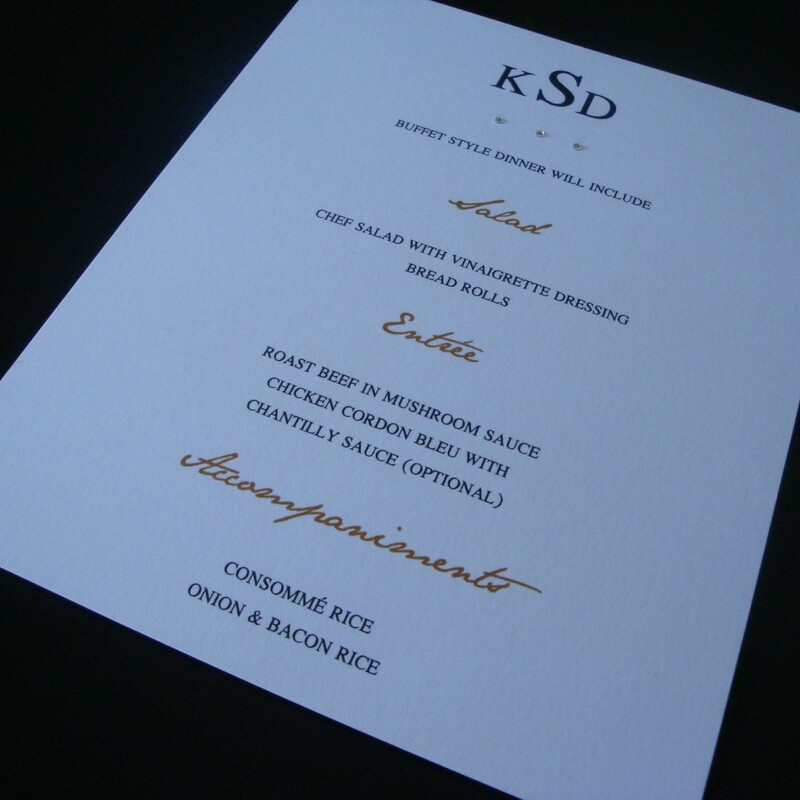 Monogrammed menu cards add an air of sophistication to the reception. The icing on the cake are the three Swarovski crystals adorning the menu. Slip this menu into a table napkin or under a clear plate. Posted in New Products, Wedding Trends. Bookmark the permalink. Hello everyone! I am sure some of you received this post in your email and realized, “Wow, I haven’t seen a post from Invites by Jen in a while.” Well, you are right – it has been a while, but I have had some major changes in my life this week that will allow me to be able to post more regularly! For those of you who are wondering, “How did they receive the post in their email?” Well, simply go up to the left hand corner at the top of this blog where there is a box that says “Subscribe”. All you have to do is enter your email address and you will receive the posts in your inbox. You will never have to remember to visit the blog to catch up! Do not worry, I am the only one who will be seeing your email!! For those of you who are wondering, “Why would I want to receive the posts in my inbox?” My answer to this question is, “Why wouldn’t you!?!? !” I will be posting new items that just became available along with card recipes (for those like enjoy stamping) and also any specials I am running. So, of course you would want to subscribe! Ok, on to the big change that occurred this week. As of Monday, Invites by Jen became full-time! I will still be working part-time from home for my former company, but only for a while as they transition into their own new adventure. So between now and the first of the year (when Invites by Jen will become EXTREMELY busy) I am just trying to get organized. This means, however, that Monday marked the fact that my dream became a reality and therefore I will now be able to blog (among other business tasks I will have to keep myself busy)! With this change also came a new home, first time homebuyers nonetheless. Part of the desire to buy this particular house was due to the fact that there was an unfinished, walk-up attic (we estimate it will add about 500 sq. ft. to our house when finished). 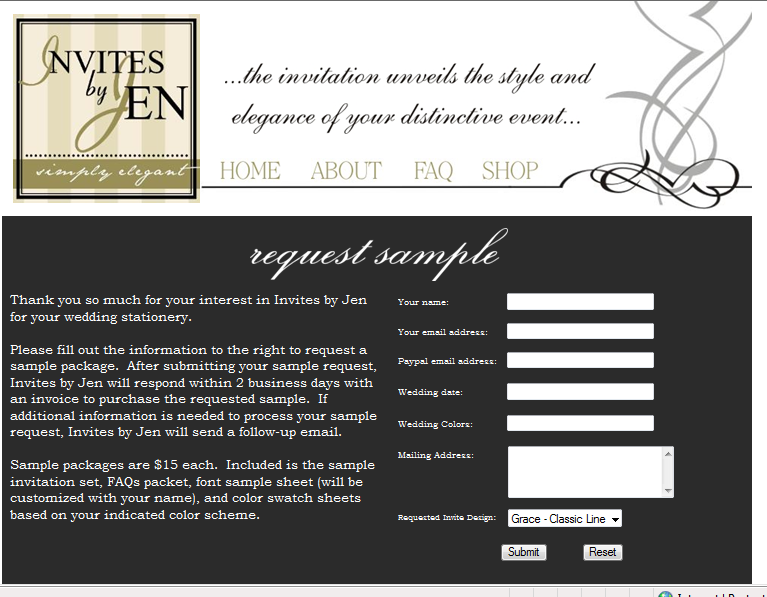 As soon as we saw this, it was very apparent how perfect the space would be for Invites by Jen’s very own studio. The drawback to it right now is that the space is still an unfinished, walk-up attic and Invites by Jen has had to set up a temporary shop in one of the spare bedrooms on 6 ft banquet tables. Also, most everything (besides my computer) is still packed up in boxes in the other spare bedroom across the hallway – this can lead to very unproductive time during the day. I have found myself spending up to an hour trying to figure out where I packed my square punches (for instance). Therefore, although I promised to post card recipes, I will just have to keep you on the edge of your seats for those until I can get things unpacked (either in my temporary room or the studio). The good news is that we just received notification that the windows we ordered are in and my hubby will be picking those up and installing them this weekend! I will then be one step closer to my new workspace! As far as things that I have done this week – well, besides breaking one of the banquet tables trying to rearrange my work space, the biggest thing I have worked on is starting to post items in my new stationery store called JCass Designs (http://www.jcassdesigns.etsy.com/). 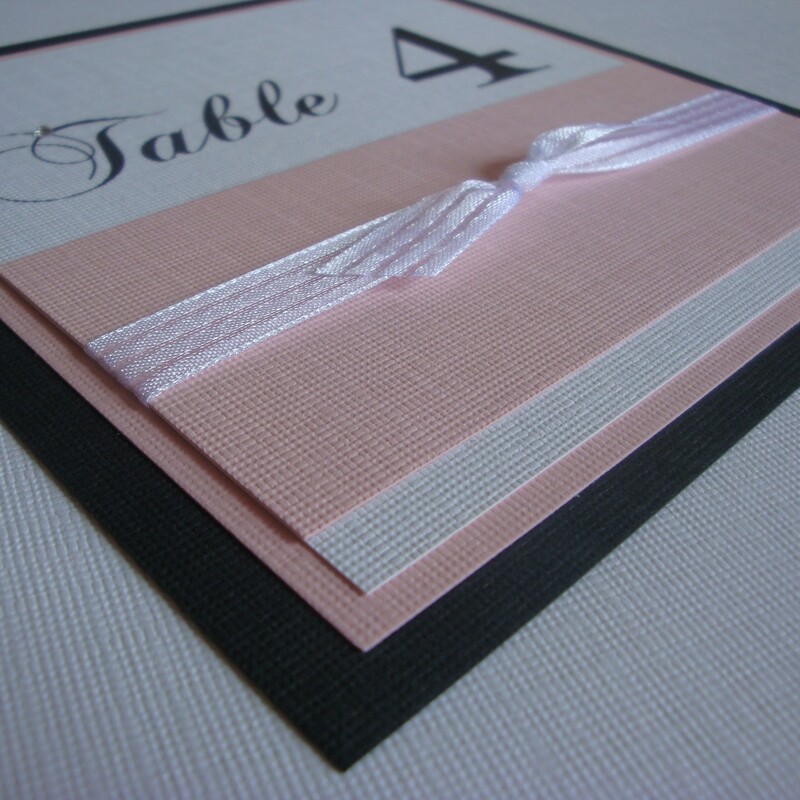 I decided to open JCass Designs in order to separate my invitation designs from my everyday stationery designs. I based the name around a nickname I was given at my former workplace – the inventor of this particular nickname was very proud to help in the design of my new business (as he should be)! This week I focused on getting a couple desk calendars designed and also a few personalized note cards (including Christmas cards) designed. The desk calendars (especially the one where customers can customize with their own pictures) will make great holiday gifts, or just a simple treat for your own desk space. They measure about 4.75 x 5.5 and come enclosed in a clear case (which doubles as the stand). The note cards are some of my favorite items though – first of all, they are personalized. This means you can put your name, someone else’s name, or a simple phrase like “thank you” on the cards. They are also blank on the inside, which allows you to write the card out to suite any occasion you need (birthday, congratulations, etc)! Since they are 4Bar in size (3.5 x 5 when finished) they are the perfect size where you could simply write “thank you” on the inside and send it on. I find them very helpful when I just want to write a quick note to someone thanking them for something they did or said. Or even just a simple “how’s it going” note on the inside to send to someone I haven’t talked to in a while. In any case, I have much more to come in the stationery store – I envision handmade recipe card packs, additional note card and calendar designs, personalized mailing labels and envelope seals, and so on. Basically anything you would make out of paper! 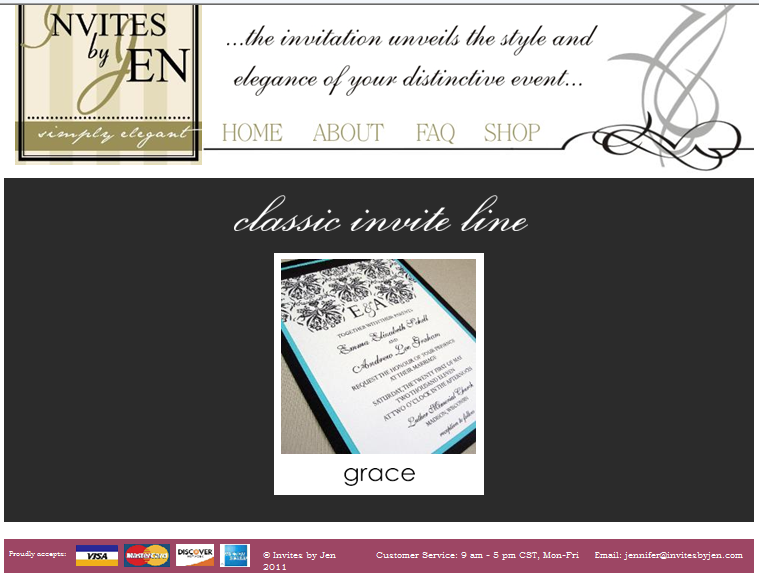 As far as Invites by Jen goes, I did add a new design to my lineup this week. I had someone contact me regarding designing them a fall-oriented invitation. I ended up making her a couple different options, but because I liked how one of them turned out, I added it as a sample option! 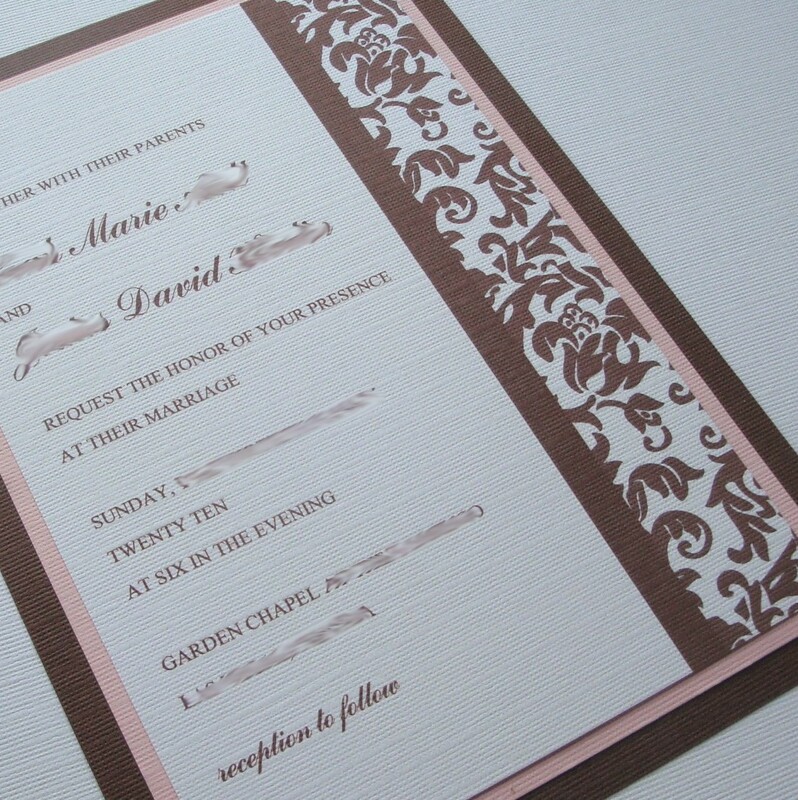 I named it the “Melinda” invitation set. It features not only my textured paper, but also a layer of metallic paper (the first invite design I have included a metallic on). It is embellished with a ribbon and, along with the leaf motif at the top, there is an initial monogram to further personalize the set. Now that I am full-time I will be able to create many more invitation designs — I have so many good ideas that have been building up in my brain! Therefore, I will have more to come very soon. My Stampin’ Up! world is also going to be picking up soon – I plan on starting my classes after the first of the year, so watch for a schedule to come out around Christmas! However, I am still continuing each month with my product shares. October’s product share featured the Polkadot Grosgrain ribbon in the In-Colors (my favorite ribbon by far right now). The UPS man delivered the goodies yesterday, so I will be working on packaging them up for everyone that participated. Watch your inbox for November’s product share! If you do not currently receive my Stampin’ Up! emails, simply send me a message at invitesbyjen@yahoo.com or leave a comment here on my blog letting me know you would like to be added. This weekend I am hoping to unpack some of my crafting goodies out of the room across the hallway. I will post again next week with the progress I am making! Posted in New Products, What's Up and Down. Bookmark the permalink.